This article describes and provides research on a wide range of non-destructive inspection & test methods, tools, procedures & standards used to examine concrete structures as well as masonry block, brick and other structures for hidden damage such as cracks, voids, omission of steel reinforcement, re-bar corrosion, and similar concerns. This article series explains how to recognize, diagnose, & repair concrete & other masonry materials used for foundations, walls, floors, roofs, and other structures. These methods can evaluate the masonry or solid concrete for signs of failures such as cracks, spalling, movement, bulging, leaks, damage due to impact, settlement, frost or water damage, corroded re-bar, corroded steel beams, vibration, and other problems. Methods of Detection of Hidden Cracks or Other Structural Damage in Concrete & Masonry Walls & Foundations are described here. Question: Is it possible to detect cracks in brick walls or concrete walls and slabs that are hidden from view by plaster? Is it possible to detect cracks in brick walls or concrete walls and slabs that are hidden from view by plaster? Like there is no through and through air pockets. If there is a way. I want to know how is it possible to detect the same. I get the use of thermal imaging but that is only possible for detecting temperatures on surface. I want something that might be able to detect cracks that is hidden about 6 - 8 inches inside the walls without breaking or damaging the wall. 1. Obvious cracks will often show up through plaster if there is ongoing movement in the masonry wall that has been plastered-over, either as plaster cracks or sometimes as a plaster bulge. 2. With thermal imaging there is a small chance you'd see a wall crack IF the crack were leaking water AND you happen to scan the wall when the leak is enough in quantity and lower temperature to show up as a temperature variation - but I'd consider such "detection" speculative. 3. There are non-destructive testing methods (such as the Echo Impact method) that can find cracks or voids in masonry structures, though in my opinion those are going to work best on placed (poured) concrete that would not be expected to have many voids. 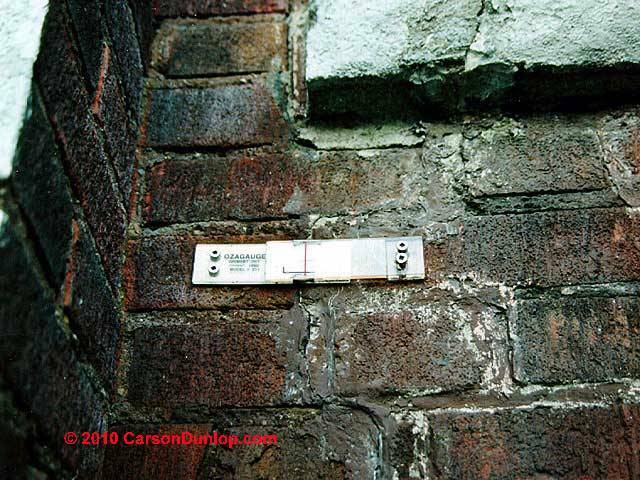 A structural brick wall will usually have an interior wall cavity and may have many other smaller voids that can be confusing when using an echo-impact masonry void detector. The tools and methods listed below are used by experts to screen or scan concrete structures for various defects such as delamination, voids, or large cracks. I'm doubtful that many of these work very well on a brick wall for reasons I cited above. 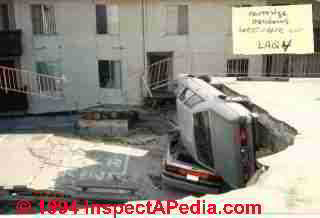 Photo: Partial collapse of the rear or West parking lot at Northridge Meadows after the Los Angeles earthquake. Even as a layman inspecting this collapse it appeared to me that even by casual inspection - after the catastrophe - one could see that the steel reinforcement had been interrupted when and just where the collapsed section of raised parking lot had broken and collapsed during this earthquake. Definition: Drossbach ducting is a metal tube manufactured from galvanised steel to create a spiral round duct that may be used along with rebar and grout to connect pre-cast concrete building components such as wall panels and floors. Definition: A Drossbach-type joint combines the ducting with re-bar and grout to join these building components. Drossbach ducting, rebar and grout jproduces post-tensioned tendons used to secure the joint between the precast wall and floor or for similar connections. The Drossbach joint may use 0.3mm galvanised steel strips with an internal diameter from 33 to 107mm- Adapted & expanded from Contech cited below. In New Zealand experts are finding increasing examples where grouted rebar connections typically between concrete floor and precast wall panels have not been addressed, compromising seismic performance and leading to horizontal cracking between floor and walls on external faces - see first link, below, courtesy of Paul Probett, Incodo, New Zealand, for suggesting this topic. The New Zealand Institute of Building Surveyors recently informed MBIE of instances of poor construction practice associated with the grouting of reinforcing steel bars inside Drossbach tubes set within reinforced concrete elements. These instances were investigated and confirmed by professional engineers. This detail is typically used as a connection between a floor substructure and precast reinforced concrete wall panels. It is also used in precast concrete frame construction, where the projecting starter bars from the previous construction stage are grouted into Drossbach tubes set within precast concrete beam or column segments for the next stage of construction. The instances reported were with concrete wall panel construction where there was either incomplete penetration of the grout or, in some cases, no grout at all around the reinforcing bars. If undetected, the resulting loss of the reinforcing bar bond under service loads may at best cause poor performance of the structural element and at worst cause premature collapse of the structural component. Site personnel, engineers reviewing construction, and building consent authority inspectors should be vigilant to ensure the tubes are effectively end sealed to prevent loss of the wet grout and that grout is injected to avoid air entrapment. Site quality practices such as non-destructive testing (NDT) should be undertaken to verify that the grout fully penetrates around the reinforcing bars. CONTACT us if you have suggestions for this topic. Concrete and re-bar joint assessment tools include GPR (Ground Penetrating Radar), electrical resistance and other electrical tests, and other methods discussed by the authors cited below. Brooke, Nicholas J., and Jason M. Ingham. "Seismic Design Criteria for Reinforcement Anchorages at Interior RC Beam-Column Joints." Journal of Structural Engineering 139, no. 11 (2012): 1895-1905. Brooke, N. J., and J. M. Ingham. "The effect of reinforcement strength on the overstrength factor for reinforced concrete beams." [PDF] In Proceedings of the 9th Pacific Conference on Earthquake Engineering, Building an Earthquake-Resilient Society, Auckland, New Zealand. 2011. Canzac, P.O Box 3181, Christchurch, New Zealand, Tel: 0800 422 692 +64 3 343 4254 Email: info@canzac.com Website: http://www.canzac.com/ Canzac is a New Zealand producer of Drossbach ducting. Cui, Y., and D. H. Zou. "Assessing the effects of insufficient rebar and missing grout in grouted rock bolts using guided ultrasonic waves." Journal of Applied Geophysics 79 (2012): 64-70. Contech, Drossbach Duct Specifications [PDF] Contech, PO Box 51-391, Pakuranga Auckland, New Zealand Email: akl@contech.co.nz Tel: +64 9 274 9259 Website: http://www.contech.co.nz Contech produces Drossbachducting and other building connection systems & components. He, Xian-Qi, Zi-Qiang Zhu, Qun-Yi Liu, and Guang-Yin Lu. "Review of GPR rebar detection." In PIERS proceedings, pp. 804-813. 2009. Krause, Vincent, Ikhlas Abdel-Qader, Osama Abudayyeh, and Sherif Yehia. "An image segmentation algorithm for the detection of rebar in bridge decks from GPR scans." In Electro/Information Technology, 2007 IEEE International Conference on, pp. 114-119. IEEE, 2007. This installation guie describes theuse of Drossbach tubes embedded vertically in the bottom edge of Litecrete panels. Perin, Deniz, and Mustafa Göktepe. "Inspection of rebars in concrete blocks." International Journal of Applied Electromagnetics and Mechanics 38, no. 2, 3 (2012): 65-78. Several precast concrete systems have been in use in New Zealand in the construction of moment resisting frames designed for earthquake resistance, despite the lack of code design guidelines. The two design codes for buildings, NZS 4203 (1984) and NZS 3101 (1982), deal only with the design of monolithic concrete construction. The use of precast concrete in moment resisting frames in New Zealand assumes that this method of construction behaves the same as monolithic reinforced concrete structures. A test programme was devised to provided experimental evidence on the seismic behaviour of the most commonly used precast concrete arrangements. Six full-scale subassemblages were quasi-statically tested under reverse load conditions with increasing displacements to failure. Four tests were conducted in H-shaped specimens connected at the beam midspan. The remaining two specimens were cruciformshaped and had the connection detail in the critical region at the beam-column joint. It was found that neither of the connection detail nor the construction joints have a detrimental effect on the seismic performance. Hence, the assumption of designing these systems as if monolithic is adequate. Theoretical work was undertaken to give simple design recommendations for the design of different connecting details, including the design of interior beam-column joints. Truss models and the concept of shear friction were extensively used. This report also discusses in some detail the stress-strain behaviour of the two grades of New Zealand manufactured reinforcing steel. Test results on the effects of bar deformations, strain ageing and strain rate on the cyclic behaviour of reinforcing steel are presented. An analytical model based on test results is postulated. RE: failures of precast panel splices, see discussion of concentrtaionof tension forces at panel splices involving Drossbach ducts beginning on p. 15. Trabanelli, G., C. Monticelli, V. Grassi, and A. Frignani. "Electrochemical study on inhibitors of rebar corrosion in carbonated concrete." Cement and Concrete Research 35, no. 9 (2005): 1804-1813. Post-tensioned precast concrete walls have been shown both experimentally and analytically to provide excellent seismic resilience. However, only a limited number of experimental tests have been conducted to investigate the dynamic response of such rocking wall systems. This paper presents the preliminary results of an experimental test program that was conducted to further understand the dynamic characteristics of post-tensioned rocking walls. The experimental test program investigated a single post-tensioned concrete wall subjected to pseudostatic cyclic loading, high speed cyclic loading, free vibration, and dynamic forced-vibration testing. The lateral load response was determined from both the pseudo-static and high speed cyclic tests, and closely matched the response calculated using an existing analysis procedure. Liang, Ming-Te, and Po-Jen Su. "Detection of the corrosion damage of rebar in concrete using impact-echo method." Cement and Concrete research 31, no. 10 (2001): 1427-1436. Xie, Xiongyao, Pan Li, Hui Qin, Lanbo Liu, and David C. Nobes. "GPR identification of voids inside concrete based on the support vector machine algorithm." Journal of Geophysics and Engineering 10, no. 3 (2013): 034002. Wang, Calvin S., Fan Wu, and Fu-Kuo Chang. "Structural health monitoring from fiber-reinforced composites to steel-reinforced concrete." Smart materials and Structures 10, no. 3 (2001): 548. Image courtesy Paul Probett, Incodo, cited at the Thermal Imaging Thermography article linked-to below. Infrared Scanners (IR) or Thermography (IT) can detect temperature variations across a masonry surface. Watch out: Using either an IR thermometer that measures temperature variation, or currently more popular, diagnostic, and more expensive, thermal imaging can show up the presence of moisture IF the moisture or leak is current. IR or IT will not reliably show up leaks whose moisture has dried since the leak occurred, though some other moisture meters that rely on resistance measurement might detect mineral salt variations left behind by prior leaks (efflorescence). Moisture meters, both pin-type and electronic, can detect variations in the moisture level across all types of masonry surfaces. The depth of sensing of pin type moisture meters (shown above) is limited to the depth of penetrations of pins of the sensor into the material, while an electronic moisture meter (shown below) can penetrate inches into the material, depending on its density and electrical properties. As with our IR and IT scanning comments in this article, a moisture meter won't reliably detect prior leaks that happen to be dry at the time of inspection and testing. See MOISTURE METER STUDY for a description of the effectiveness of different types of moisture meters used in buildings. Ultrasonic testing devices use a probe and sensor that can measure the thickness of steel reinforcement or steel beams that are nearly-buried in a masonry structure, as long as one side of the steel member can be accessed. This approach might permit detection of rust damage or loss of steel material in the hidden interior of the structural wall, roof, or slab. Lee, H. K., K. M. Lee, Y. H. Kim, H. Yim, and D. B. Bae. "Ultrasonic in-situ monitoring of setting process of high-performance concrete." Cement and Concrete Research 34, no. 4 (2004): 631-640. Song, Ha-Won, and Velu Saraswathy. "Corrosion monitoring of reinforced concrete structures-A." Int. J. Electrochem. Sci 2 (2007): 1-28. Song, G., H. Gu, Y. L. Mo, T. T. C. Hsu, and H. Dhonde. "Concrete structural health monitoring using embedded piezoceramic transducers." Smart Materials and Structures 16, no. 4 (2007): 959. Health monitoring of reinforced concrete bridges and other large-scale civil infrastructures has received considerable attention in recent years. However, traditional inspection methods (x-ray, C-scan, etc) are expensive and sometimes ineffective for large-scale structures. Piezoceramic transducers have emerged as new tools for the health monitoring of large-scale structures due to their advantages of active sensing, low cost, quick response, availability in different shapes, and simplicity for implementation. In this research, piezoceramic transducers are used for damage detection of a 6.1 m long reinforced concrete bridge bent-cap. Piezoceramic transducers are embedded in the concrete structure at pre-determined spatial locations prior to casting. This research can be considered as a continuation of an earlier work, where four piezoceramic transducers were embedded in planar locations near one end of the bent-cap. This research involves ten piezoceramic patches embedded at spatial locations in four different cross-sections. To induce cracks in the bent-cap, the structure is subjected to loads from four hydraulic actuators with capacities of 80 and 100 ton. In addition to the piezoceramic sensors, strain gages, LVDTs, and microscopes are used in the experiment to provide reference data. During the experiment, one embedded piezoceramic patch is used as an actuator to generate high frequency waves, and the other piezoceramic patches are used as sensors to detect the propagating waves. With the increasing number and severity of cracks, the magnitude of the sensor output decreases. Wavelet packet analysis is used to analyze the recorded sensor signals. A damage index is formed on the basis of the wavelet packet analysis. The experimental results show that the proposed methods of using piezoceramic transducers along with the damage index based on wavelet packet analysis are effective in identifying the existence and severity of cracks inside the concrete structure. The experimental results demonstrate that the proposed method has the ability to predict the failure of a concrete structure as verified by results from conventional microscopes (MSs) and LVDTs. Yuan, Libo, Limin Zhou, and Wei Jin. "Long-gauge length embedded fiber optic ultrasonic sensor for large-scale concrete structures." Optics & Laser Technology 36, no. 1 (2004): 11-17. A fiber optic ultrasonic sensor based on Fizeau interferometer has been developed and demonstrated. A helium–neon laser light source with wavelength Full-size image (<1 K) is used in our experiment. A special feature is its Fizeau configuration, which enables one to eliminate much undesirable noise by combining both the reference arm and the sensing arm within the same length of fiber. The dynamic response model of photo-elastic effect of ultrasonic wave and optical fiber is established. The fiber optic ultrasonic sensor experimental results are obtained and compared with the convenient PZT transducer. Vibration monitoring can assess the amount of building movement caused by traffic, an earthquake, or nearby construction work or blasting. Vibration monitoring is particularly apt to monitor nearby buildings for the impact of an ongoing construction project. Dimarogonas, Andrew D. "Vibration of cracked structures: a state of the art review." Engineering fracture mechanics 55, no. 5 (1996): 831-857. The presence of a crack in a structural member introduces a local flexibility that affects its vibration response. Moreover, the crack will open and close in time depending on the rotation and vibration amplitude. In this case the system is nonlinear. Furthermore, if general motion is considered, the local stiffness matrix description of the cracked section of the shaft leads to a coupled system, while for an uncracked shaft the system is decoupled. 2. (2) longitudinal and torsional harmonics are present in the start-up lateral vibration spectrum due to the coupling. Over 500 papers on the subject were published in the past 10 yrs. A wealth of analytical, numerical and experimental investigations now exists. However, a consistent cracked bar vibration theory is yet to be developed. There are still many unanswered questions, especially in the area of closing cracks in rotating shafts. Dong, Xing-Jian, Guang Meng, and Juan-Chun Peng. "Vibration control of piezoelectric smart structures based on system identification technique: Numerical simulation and experimental study." Journal of Sound and Vibration 297, no. 3 (2006): 680-693. Schulz, Whitten L., Joel P. Conte, and Eric Udd. "Long-gage fiber optic Bragg grating strain sensors to monitor civil structures." In SPIE's 8th Annual International Symposium on Smart Structures and Materials, pp. 56-65. International Society for Optics and Photonics, 2001. Yam, L. H., Y. J. Yan, and J. S. Jiang. "Vibration-based damage detection for composite structures using wavelet transform and neural network identification." Composite Structures 60, no. 4 (2003): 403-412. This paper presents an integrated method for damage detection of composite structures using their vibration responses, wavelet transform and artificial neural networks (ANN) identification. Structural damage feature proxy vectors are constructed and calculated based on energy variation of the structural vibration responses decomposed using wavelet package before and after the occurrence of structural damage. The ANN are applied to establish the mapping relationship between structural damage feature proxy and damage status (location and severity). The results of crack damage detection for PVC sandwich plates show that the method developed in this paper can be applied to online structural damage detection and health monitoring for various industrial structures. A borescope won't be much help in an external screen of a masonry structure for hidden damage but it might allow a view of exposed surfaces that are blocked by obstructions such as a radiator or HVAC equipment. A simple inspection mirror and a good light may also suffice. Borescopes can give a limited view of the inspection of a wall cavity. So you might inspect the cavity side of a brick veneer wall by probing the wall cavity from the building interior. 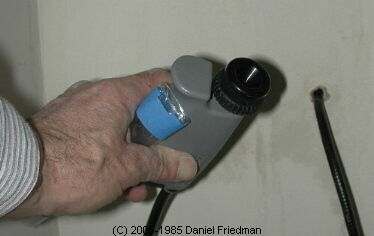 See HIDDEN MOLD in CEILINGS / WALLS for examples of better use of a borescope. A pachometer is a non-destructive magnetic sensor that can find buried steel in masonry structures. A pachometer can be used thus to find re-bar, reinforcing steel mesh, and hidden steel beams. Keep in mind that pipes, expanded metal lath, metal conduit will also be detected by this tool. Technical use of a pachometer in evaluating a concrete structure would be the confirmation of re-bar spacing and sizes as well as depth of the re-bar in a concrete ceiling, roof, wall, foundation, or slab. We might aso use a pachometer to check the depth of metal radiant heat piping in an older radiant heat floor. Giasson, Claude, and Daniel Forthomme. "Comparison of central corneal thickness measurements between optical and ultrasound pachometers." Optometry & Vision Science 69, no. 3 (1992): 236-241. Roddis, W. M. "Concrete bridge deck assessment using thermography and radar." PhD diss., Massachusetts Institute of Technology, 1987. Tay, D. C. K., and C. T. Tam. "In situ investigation of the strength of deteriorated concrete." Construction and Building Materials 10, no. 1 (1996): 17-26. A necessary prerequisite for devising a restoration scheme for a deteriorating structure is the acquisition of relevant in situ data to be used for evaluating structural adequacy as well as defining the scope of the restoration work. The methodology for conducting a successful structural in situ investigation includes: strategic planning, preliminary visual inspection, loading assessment, material property evaluation and load testing techniques. The single most sought after material property used for the evaluation of residual load capacity and structural adequacy of deteriorated concrete structures is the in situ concrete strength. The most direct method of obtaining this data is to test core specimens retrieved from the structure. It is not, however, always feasible to core for specimens and even if it is, the number of cores that can be taken is often limited. The solution is therefore to use indirect non-destructive and partially destructive techniques which measure concrete properties other than strength in combination with testing core specimens. Several of those techniques especially suited for in situ investigation are reviewed. Prior to using any of the indirect methods, a correlation needs to be established with the in situ concrete strength. Flatjack testing can detect deformed or stressed unreinforced masonry walls (concrete block, brick) and may detect deformation in concrete walls & foundations. Flatjack testing is also described (Carpinteri 2004) as acoustic emission (AE) technique, a non-destructive instrumental investigation method ... to measure and check the evolution of damage in concrete and masonry structures. Binda, L., C. Modena, G. Baronio, and S. Abbaneo. "Repair and investigation techniques for stone masonry walls." Construction and Building Materials 11, no. 3 (1997): 133-142. Carpinteri, Alberto, Stefano Invernizzi, and Giuseppe Lacidogna. "Historical brick-masonry subjected to double flat-jack test: Acoustic emissions and scale effects on cracking density." Construction and Building Materials 23, no. 8 (2009): 2813-2820. The results obtained varying the size of the masonry prism involved in the double flat-jack test are described. In these tests, not only the deformations have been acquired, but also the acoustic emissions (AE) events, in order to get information about local cracking in the specimens. In addition, a meso-scale numerical model of the test is presented, where every brick of the masonry is modeled in details. Discrete cracks can arise both in the mortar joints and in the brick units. A good correlation is found between the amount of cracking simulated numerically and the experimental AE events for different prism sizes. The model is also able to catch the decrease in the compressive strength with increasing size. Although a quantitative relation between the AE events and the amount of cracking is not easy to obtain, we have been able to prove that the two quantities are simply proportional to each other when increasing specimen sizes are considered, whereas both of them are not proportional to the same sizes, but rather obey a power-law. Carpinteri, Alberto, Giuseppe Lacidogna, and Nicola Pugno. "A fractal approach for damage detection in concrete and masonry structures by the acoustic emission technique." [PDF] Acoustique et Techniques 38, no. 3 (2004): 31-37. Garbowski, Tomasz, Giulio Maier, and Giorgio Novati. "Diagnosis of concrete dams by flat-jack tests and inverse analyses based on proper orthogonal decomposition." Journal of Mechanics of Materials and Structures 6, no. 1 (2011): 181-202. Gregorczyk, Paweł, and Paulo B. Lourenço. "A review on flat-jack testing." (2000). Noland, J. L., G. R. Kingsley, and R. H. Atkinson. "Utilization of nondestructive techniques into the evaluation of masonry." In Proceedings of the 8 th International Brick/Block Masonry Conference Dublin, Ireland, 19-21 September 1988,, pp. 1693-1703. 1988. Ground penetrating radar (GPR) is widely used in broad-scope sitework to locate buried metal items such as a buried oil tank. GPR uses an electromagnetic pulse that is reflected back to the instrument at varying signal levels based on what the pulse encounters in the pulsed area. Synonyms for ground penetrating radar or GPR include EMR (Electromagnetic Reflection), SIR (Subsurface Interface Radar), georadar, subsurface penetrating radar, and soil radar. (Blindow 2007). GPR is also used in a more-technical application to find buried steel beams or reinforcement in a concrete structure. GPR can report on the location and thickness of steel or other metallic components hidden from view in solid structures, including re-bar, steel mesh, beams, as well as conduit and metal water pipes, even metallic ducctwork. Annan, A. P. "Ground-penetrating radar." In Near-surface geophysics, pp. 357-438. Society of Exploration Geophysicists, 2005. Ground-penetrating radar (GPR) is a relatively young geophysical technique. First uses appeared in the 1960s with radio echo sounding of glaciers and ice sheets (Bailey et al., 1964) followed by permafrost analysis (Annan and Davis, 1976). Applications spread with major changes commencing in the 1990s. The history of GPR is intertwined with the diverse applications of the technique. GPR has the most extensive set of applications of any geophysical technique leading to a wide range of spatial scales and concomitant diversity of instrument configurations. A chronological history can be found in Annan (2002). Blindow, Norbert, Dieter Eisenburger, Bernhard Illich, Hellfried Petzold, and Thomas Richter. "Ground penetrating radar." In Environmental Geology, pp. 283-335. Springer Berlin Heidelberg, 2007. Davis, J. Lꎬ, and A. P. Annan. "Ground‐penetrating Radar For High‐resolution Mapping Of Soil And Rock Stratigraphy." Geophysical prospecting 37, no. 5 (1989): 531-551. Griffin, Stephen, and Timothy Pippett. "Ground penetrating radar." Geophysical and Remote Sensing Methods for Regolith Exploration, CRC LEME Open File Report 144 (2002): 80-89. Strain gauge monitoring equipment or devices are affixed in place across concrete, masonry block, brick or other surfaces where cracks are to be monitored for movement, deformation, or change. See CRACK MONITORING METHODS - Methods for Monitoring Foundations for Evidence of Ongoing or Episodic Movement. Impact-echo testing, one of the most widely-used concrete testing method for concrete and masonry, combines an impact device and sensor with (typically) a computer and special software to analyze sound waves or vibrations in solid concrete structural walls, floors, ceilings. Impact echo testing can locate areas of damage to the concrete structure that are not readily visible, such as cracks in a concrete wall that are covered by plaster. Echo tests can report on the location, size, pattern, and thus severity of cracks in the structure. The Impact Echo (IE) system is designed to determine the condition and thickness of concrete, wood, stone, and masonry structural members when voids, honeycomb, and/or cracks are suspected. IE investigations can also be performed to predict the strength of early age concrete if the member thickness is known. Lastly, the IE method will provide information on the depth of a flaw or defect, in addition to mapping its lateral location and extent. An advantage of the IE method over the Ultrasonic Pulse Velocity (UPV) method is that only one side of the structure needs to be accessible for testing. Mary J. Sansalone1 (PhD, Cornell) is the principal inventor of the impact-echo method, and a leading authority on the use of transient stress waves for nondestructive evaluation of heterogeneous materials. ... She shares a patent with one of her former graduate students for a portable, computer-operated system for impact-echo testing in the field. William B. Streett (PhD, University of Michigan) is the President of Impact-Echo Instruments, LLC, a company that manufactures and markets impact-echo test equipment. ... He was a member of the faculty of Cornell University from 1978-95, and was Dean of Engineering from 1984-93. ... He is the author of the software that is used with the impact-echo field unit manufactured by his company. Impact-echo is an acoustic method for nondestructive evaluation of concrete and masonry, invented at the U.S. National Bureau of Standards (NBS) in the mid-1980's, and developed at Cornell University, in Ithaca, New York, from 1987-1997. This article provides a brief description of the method, information about test equipment manufactured by Impact-Echo Instruments, LLC of Ithaca, New York , a description of a new book about impact-echo, and a list of case studies describing a variety of applications. In December of 1997 the American Society of Testing Materials (ASTM) approved a new standard entitled, "Standard Test Method for Measuring the P-Wave Speed and the Thickness of Concrete Plates Using the Impact-Echo Method." This standard will appear in the 1998 Annual Book of ASTM Standards. A rebound hammer is used to evaluate the quality and uniformity of "cured" or hardened concrete walls, floors, foundations. ASTM C805 describes the use of this test to assess the uniformity of concrete "in place" and to find "regions of poor quality or deteriorated concrete". The accuracy of this test method is affected by a number of site factors including the smoothness of the concrete surface, the age and moisture content of the concrete, extent of surface carbonation, the use of aggregate and its properties, the presence of air voids, the nearby presence of reinforcing steel, the concrete temperature, and the care with which the rebound hammer was calibrated. The [rebound hammer] consists of a plunger rod and an internal spring loaded steel hammer and a latching mechanism. When the extended plunger rod is pushed against a hard surface, the spring connecting the hammer is stretched and when pushed to an internal limit, the latch is released causing the energy stored in the stretched spring to propel the hammer against the plunger tip. The hammer strikes the shoulder of the plunger rod and rebounds a certain distance. There is a slide indicator on the outside of the unit that records the distance traveled during the rebound. This indication is known as the rebound number. By pressing the button on the side of the unit, the plunger is then locked in the retracted position and the rebound number (R-number) can be read from the graduated scale. 5.1 This test method is applicable to assess the in-place uniformity of concrete, to delineate variations in concrete quality throughout a structure, and to estimate in-place strength if a correlation is developed in accordance with 5.4. 5.2 For a given concrete mixture, the rebound number is affected by factors such as moisture content of the test surface, the type of form material or type of finishing used in construction of the surface to be tested, vertical distance from the bottom of a concrete placement, and the depth of carbonation. These factors need to be considered in interpreting rebound numbers. 5.3 Different instruments of the same nominal design may give rebound numbers differing from 1 to 3 units. Therefore, tests should be made with the same instrument in order to compare results. If more than one instrument is to be used, perform comparative tests on a range of typical concrete surfaces so as to determine the magnitude of the differences to be expected in the readings of different instruments. 5.4 Relationships between rebound number and concrete strength that are provided by instrument manufacturers shall be used only to provide indications of relative concrete strength at different locations in a structure. Establish the relationship by correlating rebound numbers measured on the structure with the measured strengths of cores taken from corresponding locations (see Note 2). At least two replicate cores shall be taken from at least six locations with different rebound numbers. Select test locations so that a wide range of rebound numbers in the structure is obtained. Obtain, prepare, and test cores in accordance with Test Method C42/C42M. If the rebound number if affected by the orientation of the instrument during testing, the strength relationship is applicable for the same orientation as used to obtain the correlation date (see Note 3). Locations where strengths are to be estimated using the developed correlation shall have similar surface texture and shall have been exposed to similar conditions as the locations where correlation cores were taken. The functionality of the rebound hammer shall have been verified in accordance with 6.4 before making the correlation measurements. 5.1 This test method is applicable to assess the uniformity of concrete and to delineate zones of poor quality or deteriorated concrete in structures. 5.2 This test method is applicable to estimate in-place strength, provided that a relationship has been experimentally established between penetration resistance and concrete strength. Such a relationship must be established for a given test apparatus (see also 9.1.5), using similar concrete materials and mixture proportions as in the structure. NOTE 1: Since penetration results may be affected by the nature of the formed surfaces (for example, wooden forms versus steel forms), correlation testing should be performed on specimens with formed surfaces similar to those to be used during construction. 5.3 Steel probes are driven with a high-energy, powder-actuated driver, and probes may penetrate some aggregate particles. Probe penetration resistance is affected by concrete strength as well as the nature of the coarse aggregate. Steel pins are smaller in size than probes and are driven by a low energy, spring-actuated driver. Pins are intended to penetrate the mortar fraction only; therefore, a test in which a pin strikes a coarse aggregate particle is disregarded. 5.4 This test method results in surface damage to the concrete, which may require repair in exposed architectural finishes. 1.1 This test method covers the determination of the resistance of hardened concrete to penetration by either a steel probe or pin. 1.2 The values stated in either SI units or inch-pound units are to be regarded separately as standard. The values stated in each system may not be exact equivalents; therefore, each system shall be used independently of the other. FOUNDATION CRACK DICTIONARY where we describe dragging a chain across a concrete floor to detect voids and settlement. Half-cell testing is an electronic test method that guesses at the level of active corrosion of steel reinforcement (re-bar or steel mesh) in reinforced concrete structures. In most-general terms, a half-cell test for metal corrosion is based on the reaction of anodes and cathodes. Factors influencing the accuracy of half-cell tests on concrete to screen for corrosion of its rebar include the oxygen concentration at the interface of the re-bar and the concrete, the amount of concrete carbonation (reaction between atmospheric CO2 and CaOH in the concrete that reduces the pH of the steel-concrete interface, chloride ion concentration, the use of corrosion inhibitors at the time of construction, the use of expoxy-coated or galvanized re-bar, the density of the concrete cover, the use ofhigh-resistance concrete, the presence of organic coatings or sealants on the concrete surface, the presence of a concrete patch or other repair, and the presence of cathodic protection systems attached to the re-bar along with the problem of stray electrical currents. Although it was blamed on excessive piling up of snow, the 2007 collapse of a section of the Poughkeepsie Galleria's parking garage might have been predicted had a prior survey been made using Half-Cell testing and a Pachometer to assess the presence of steel reinforcement as well as its condition. Ahmad, Shamsad. "Reinforcement corrosion in concrete structures, its monitoring and service life prediction––a review." Cement and concrete composites 25, no. 4 (2003): 459-471. Elsener, B., C. Andrade, J. Gulikers, R. Polder, and M. Raupach. "Hall-cell potential measurements—Potential mapping on reinforced concrete structures." Materials and Structures 36, no. 7 (2003): 461-471. The half-cell potential measurement is an electrochemical technique commonly used by engineers to assess the severity of corrosion in reinforced concrete structures. This Update explains how various factors can affect the reliability of the data obtained. Corrosion of steel reinforcement is a major factor in the deterioration of highway and bridge infrastructure. A survey of the condition of a reinforced concrete structure is the first step towards its rehabilitation. A rapid, cost-effective and non-destructive condition survey offers key information on the evaluation of corrosion, and aids in the quality assurance of concrete repair and rehabilitation and in the prediction of remaining service life. The simplest way to assess the severity of steel corrosion is to measure the corrosion potential, since it is qualitatively associated with the steel corrosion rate. One can measure the potential difference between a standard portable half-cell, normally a copper/ copper sulphate (Cu/CuSO4) standard reference electrode placed on the surface of the concrete with the steel reinforcement underneath. Figure 1 illustrates the basics for such a measurement, also called half-cell potential measurement. The reference electrode is connected to the negative end of the voltmeter and the steel reinforcement to the positive. Confidence in the half-cell potential measurement as an indication of corrosion potential has evolved owing to the success of bridge deck corrosion surveys. An indication of the relative probability of corrosion activity was empirically obtained through measurements during the 1970s. [1-2] This work formed the basis of the ASTM standard C876, which provides general guidelines for evaluating corrosion in concrete structures as outlined in Table 1. 4.1 This test method is suitable for in-service evaluation and for use in research and development work. 4.2 This test method is applicable to members regardless of their size or the depth of concrete cover over the reinforcing steel. Concrete cover in excess of 3 in. (75 mm) can result in an averaging of adjacent reinforcement corrosion potentials that can result in a loss of the ability to discriminate variation in relative corrosion activity. 4.3 This test method may be used at any time during the life of a concrete member. 4.4 The results obtained by the use of this test method shall not be considered as a means for estimating the structural properties of the steel or of the reinforced concrete member. 4.5 The potential measurements should be interpreted by engineers or technical specialists experienced in the fields of concrete materials and corrosion testing. It is often necessary to use other data such as chloride contents, depth of carbonation, delamination survey findings, rate of corrosion results, and environmental exposure conditions, in addition to corrosion potential measurements, to formulate conclusions concerning corrosion activity of embedded steel and its probable effect on the service life of a structure. 1.1 This test method covers the estimation of the electrical corrosion potential of uncoated reinforcing steel in field and laboratory concrete, for the purpose of determining the corrosion activity of the reinforcing steel. 1.2 This test method is limited by electrical circuitry. Concrete surface in building interiors and desert environments lose sufficient moisture so that the concrete resistivity becomes so high that special testing techniques not covered in this test method may be required (see 5.1.4.1). Concrete surfaces that are coated or treated with sealers may not provide an acceptable electrical circuit. The basic configuration of the electrical circuit is shown in Fig. 1. Continue reading at CONCRETE FOUNDATION, WALL, SLAB DEFECTS - home, or select a topic from closely-related articles below, or see our complete INDEX to RELATED ARTICLES below. Or see FOUNDATION CRACK DICTIONARY detailed process of evaluating foundation cracks and signs of foundation damage by examining the crack size, shape, pattern, and location. CONCRETE or MASONRY DAMAGE TESTS at InspectApedia.com - online encyclopedia of building & environmental inspection, testing, diagnosis, repair, & problem prevention advice. I agree that one needs to find the source of water or moisture in order to be able to correct it, followed by drying out the crawl area. and let me know what specific questions remain. Most likely the footing has shifted, or if the brick is a veneer wall its support or the attachment of that support to the foundation (some veneers used an L-bracket) may have failed. We'd need to see details or photos - for which you can use the page top or bottom CONTACT link if you like. Watch out: loose brick walls, if the bond courses or for a veneer the connections to the structure are broken there is danger of a collapse that could cause injuries or worse. What is the possible cause of a brick wall that has shifted on the foundation footing on one end. There is about 1/2" of overhang of the bricks on the footing on about 1/4 of the wall. There has been movement and repairs to the foundation. I can't reliably diagnose your foundation wall failure from just your e-text; one needs to look both outside and inside for conditions that affect the foundation. A foundation damage diagnosis of "failure over time" is 100 % baloney despite your inspector's credentials. It is in essence nearly content-free. A building foundation is not a consumable that gets "used-up" over time until it fails. Rather what your engineer may have meant to say (perhaps he skipped Freshman English) was that the cracked or buckled foundation damage did not occur in a single event but rather that it happened over time. To support that conclusion, and to avoid an endless battle of "opinions" in our current world where objective data and facts are either insufficiently valued or are deliberately de-valued in order to serve someone's purpose, a decent engineer ought to have said what he observed, found, measured, that supported that conclusion. For example if I find old paint, dust, dirt, inside a horizontal crack in a bulged block foundation wall I am confident that the bulge and crack didn't happen yesterday, even if yesterday's forces might have exacerbated it. IF you have photographs of the foundation wall before the flooding and freezing event that your email suggests occurred then you could prove rather convincingly that the even coincided with the burst hose and - this is correct, right? - that the soaking of the ground was followed by freezing weather that might have added frost-push to wet-soil loading against the wall. It sounds as if you are describing mineral salts or effloresence - search InspectApedia for EFFLORESENCE to read the details of what this is and how to prevent it. As a lintel usually carries weight, I wouldn't assume that a break is harmless unless you mean to say that the lintel was too long for the space into which it was being inserted and one-end broke off; that is, any crack or break in the open span of the lintel is surely going to mean trouble, as might insufficient bearing area under the lintel ends in the wall. You can send photos using the page top or bottom CONTACT link. I have a leaning exterior brick wall that is approximately 5' tall and 20 'long. It is leaning and also needs some tuck pointing . Is there anyway of bracing the way other than tearing it down and starting over? The earth on one side of wall is higher than the other. Also, I am not sure of any footings. For a brick wall that is supported by a foundation, the width of that footing is determined by the original design engineer, architect or contractor based on soil properties as well as anticipated weight or loading from above. If the footing width were so wide that you could in principle move the brick wall that rests on it 50cm without finding the brick wall now off of the foundation completely, you could do so, but the risk is that the wall begins to tip or lean, ultimately collapsing. My question is can I move a brick wall fence, with foundation of reinforced concrete strip foundation, to the right or left up to 50cm? 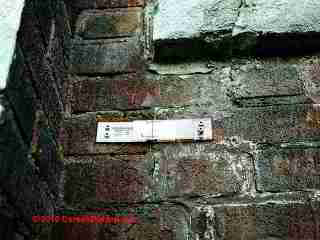 Many bricks are chipped mold has repeatedly been corrected, only on inside wall. Soon the new paint on that inside wall is peeling. This is a COOP. It is now two & halp years. I cannot get a full nights sleep waking up with itchy eyes. Thomas thanks for the nice comment about our website content. We know that we have many readers in Australia and New Zealand and I'm anxious to add terms and technical details that match those used in your area. While climate and constuction practices vary around the world, brick and masonry construction in general suffers similar problems in most places - often it's the local names for materials & construction methods that vary more than the materials and pracices themselves. One man's septic drainfield is another's soakaway bed. We'd welcome specific questions, comments on different construction terminology used in different parts of the world, etc. We are dedicated to making our information as accurate, complete, useful, and unbiased as possible: we very much welcome critique, questions, or content suggestions for our web articles. Working together and exchanging information makes us better informed than any individual can be working alone. Questions & answers or comments about structural brick foundations & brick walls: crack, leak, or movement diagnosis, defects, & repairs, risks of collapse.